Mega Man has been enlisted to help raise awareness about cyber security in Osaka, the prefecture's police force announced. The government has declared February 1st through March 18th as "Cyber Security Awareness Month", and Mega Man will be there front and center. 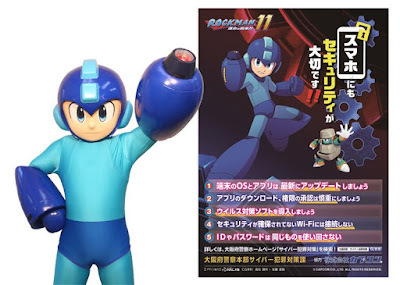 Mega Man will be honored with a letter of certification on February 1st at the Osaka Station Atrium Plaza (North Gate Building, 2nd floor) on February 1st at 2pm. Citizens and fans are encouraged to come and watch the event and pick up some exclusive, Mega Man-endosred cyber security goods. Although Mega Man.EXE would probably be a bit more fitting here, it's Mega Man's classic incarnation that will be the face of the month. It doubles as a special promotion for Mega Man 11, too. If you're in the area, why not check it out? Don't worry, Mega Man is the public face. Meanwhile, EXE is patrolling the beat. Does it count if I got it as a Christmas gift? Not because I did not want to buy it, but I needed to hold off on buying it when it first came out, and by the time I was able to, my friend had already left a not-so-subtle hint that he had gotten it for me for Christmas. @Protodude: That was never confirmed, though. They could be working on anything. Not *explicitly* confirmed, but it is heavily implied. ....is this the beginning of the maverick hunters? If it gets us MegamanX.EXE, yes! Eh. Mega Man Classic has entered cyberspace (at least as of MM10), so 'no harm no foul' in using Classic instead of EXE from a fan's standpoint. That's awesome, would have been kinda cool to see X as well.